She’s got big dark eyes, thick lashes, long muscular legs and hilariously oversized feet. As a petite example of Australian wildlife, she’s also a breath of fresh air in the intense moments building Queensland‘s newest luxury camping experience. Welcome ‘Lilly Pilly’ (named after the trees so common in this region). The baby red-necked wallaby joey captured our hearts the instant we scooped her quivering body off Christmas Creek road. Her mother was nowhere to be seen. Judging by the grazes on the youngster’s legs, we assume both were hit by a car – an unfortunately common occurrence on Australia’s roads. 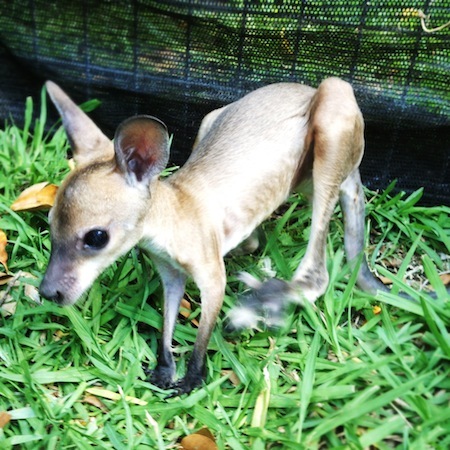 At first glance the young macropod is a comical combination of carton-mouse head, over-size ears, the body of a rat and disproportionately large T-Rex rear limbs. With kangaroos, echidnas, koalas and platypus, it’s easy to see why Australia’s unusual mammals baffled early naturalists. On first reports, the platypus – an egg-laying, rubber-billed mammal with fur and the webbed feet of a duck – was even considered an elaborate fraud. Fortunately Lilly Pilly is an easy charge – relaxed, comfortable and curious about her surrounds. She’s also intriguing. She washes herself like a cat, licks in affection and dips her head to say please tickle my neck a little more. As her adopted ‘mum’, my favourite time of day is when she emerges from her pouch to nibble on grass roots and cavort around her play-pen. She stumbles like a drunk when she forgets she doesn’t always have the co-ordination to scratch and stand at the same time. As her confidence grows, it’s time for laps. She bounces here and there before making a quick run for the pouch, tumbling in classic joey style into foetal position to catch her breath and regroup. 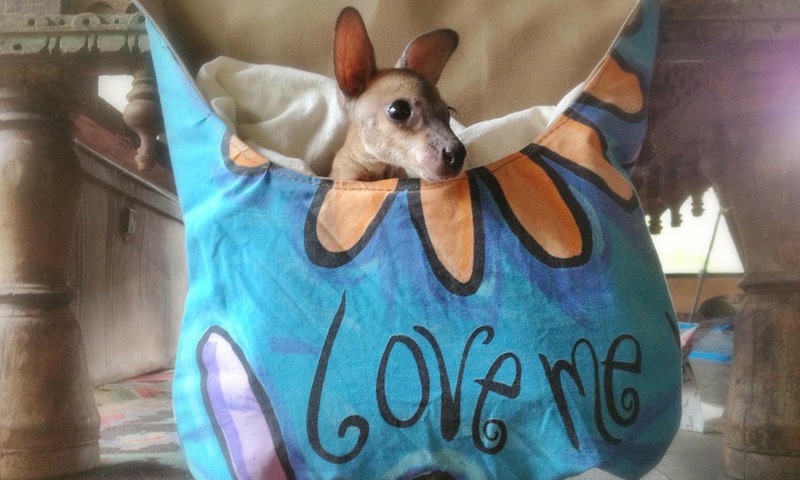 On rare moments she’s more grown-up, sticking only her head into the pouch to collect herself. Lilly Pilly’s arrival has helped put perspective into the intensity of this final push to complete the building of Nightfall wilderness camp’s Queensland glamping experience. Feeding the young joey every four-and-a-half-hours, day and night, enforces moments of quiet contemplation, deepening my connection with our Australian wildlife, Nightfall’s surrounds and my sense of wonderment at the cleverness of nature. We’re now into the nitty-gritty of construction, adding layers of detail to our permanent tent accommodation. It’s slow considered work, where attention to the creative and innovative is paramount. Consider the bathroom fit-out: it would have been easy to walk into a major franchise to pick off-the-rack taps, but that’s not Nightfall. Even when you have great ideas, there are stumbling blocks in the plumbing and building regulations. Taps alone must have hot and cold symbols and WELS certification. Rejecting the mainstream chrome took us along a bumpy journey, eventually culminating with the discovery of New Zealand’s Heritage Bathware company. Their aged copper and brass tapware was exactly what we’d been looking for. Heritage Bathware owner Michael Brown lovingly handcrafts rain-head showers and adds his distinctive touch to vintage taps. He also has great vision, easily grasping styles which differ from the norm. We now wait excitedly to put the look together when the plumber returns. COMING SOON: ANNOUNCING NIGHTFALL’S OPENING DATE AND LIMITED OPENING-CELEBRATION OFFER.